East Asia is a region deeply affected by conflict. Colonial, ideological, and national wars have left their scars and legacies on regional, international, and national governance. Yet East Asian post-conflict development experiences have been viewed as remarkably successful. The three largest economies of East Asia, Japan, China, and South Korea, have all experienced dramatic growth but immediately prior to their periods of expansion, all experienced the devastating impacts of international conflicts and/or civil upheaval. These post-conflict development ’success’ stories do not, however, tell the whole tale. Other states in East Asia and in particular certain regions within some of these states, while apparently emerging from similar conflictual backgrounds, have experienced far less positive transitions. 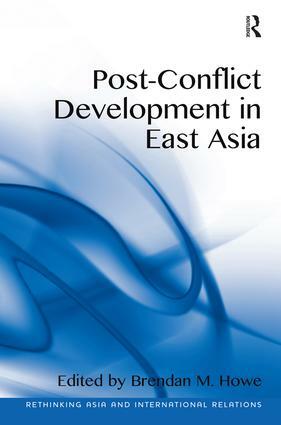 This volume critically assesses measurements of success in East Asian post-conflict development from a human-centered perspective. This involves a major re-evaluation of accepted accounts of domestic governance and international relations in East Asia from both a comparative and inter-disciplinary viewpoint. Case study rich, this volume provides policy prescriptions for East Asian donors and actors in an effort to provide Asian solutions for Asian problems. Brendan M. Howe, Ewha Womans University, Korea.